A magnificent honor board, containing the names of 170 soldiers who enlisted from Leigh Shire, and which was presented to the Shire by Commander Biddlecombe, of Golf Hill, Shelford, was unveiled on Wednesday afternoon in the Shire Hall by President A. P. Hingley, in the presence of a large gathering of soldiers, representative citizens and interested friends of Leigh Shire warriors. The board, which is of very handsome design, is 8ft. 6in. long by 6ft. 6in. high. It is made with Victorian agured blackwood framing, with Queensland maple panels, and the pilasters are mounted with representations of Australian foliage carved in relief. 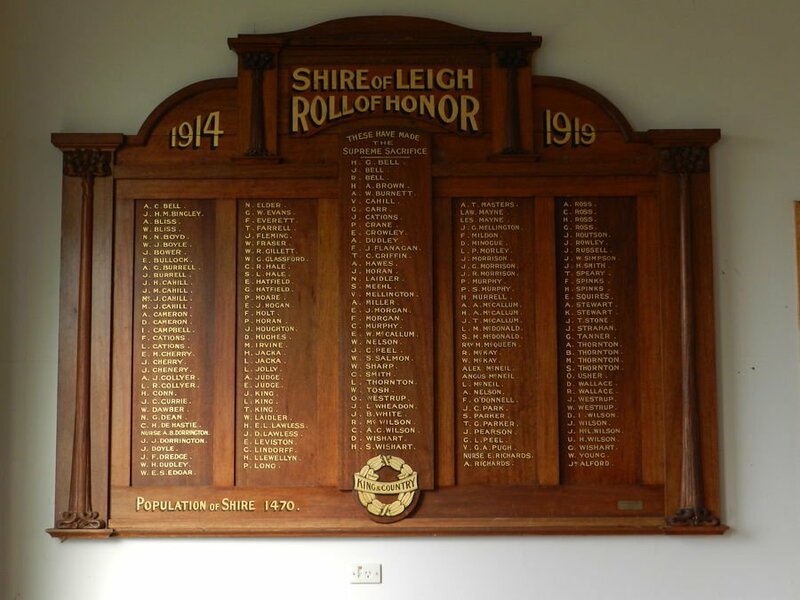 The inscription reads : ''Shire of Leigh Roll of Honor. For King and Country," with the dates 1914-1919, and in one corner is shown the population of the shire as 1470. Included in the names on the board are 39 who paid the supreme sacrifice, and these are inscribed on the centre panel by themselves, with the memorial wreath at the bottom, with the inscription, King and Country, on it. Above the board a handsome pediment has been mounted, the design of which is in keeping with the honor board, and is fitted with a linen blind, which can be drawn down, and covers the whole of the board when not in use. The whole thing makes a very handsome and suitable memorial for the boys who left this district to serve for King and Empire, and it also reflects credit on Messrs. R. Tunbridge and Sons, of Ballarat, who designed and manufactured it. After the singing of the National Anthem, President Bingley said it was most gratifying to see such a large gathering of ratepayers of the shire present to see the honor board, which was to be unveiled as a tribute of appreciation of the lads for what they had done in the Great War. 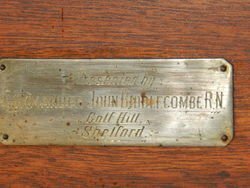 They had to thank Commander Biddlecombe for placing on record the names of those who donned the khaki, and to the everlasting credit of the shire it could be noticed that a very great proportion of the lads in the shire had enlisted. He then unveiled the honor board amidst an outburst of applause. Excerpt from Geelong Advertiser (Vic), 13 November 1920.